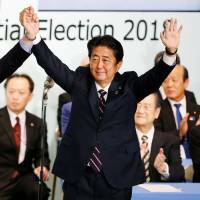 As was widely expected, Prime Minister Shinzo Abe won Thursday’s presidential election to lead the ruling Liberal Democratic Party, allowing him to continue as prime minister for up to three more years if all goes according to the party’s plans. But now that the votes are in, is there much for Abe to celebrate? Thursday’s victory brings with it the start of a highly risky political battle for him, experts say, if not the beginning of the end of his administration — which has already lasted for nearly six years. Prior to the LDP vote, Abe had pledged to initiate a national referendum to revise the war-renouncing Article 9 of the postwar Constitution. The revision would formalize the legal status of the Self-Defense Forces, a long-held aspiration for right-leaning politicians and intellectuals, including Abe himself. 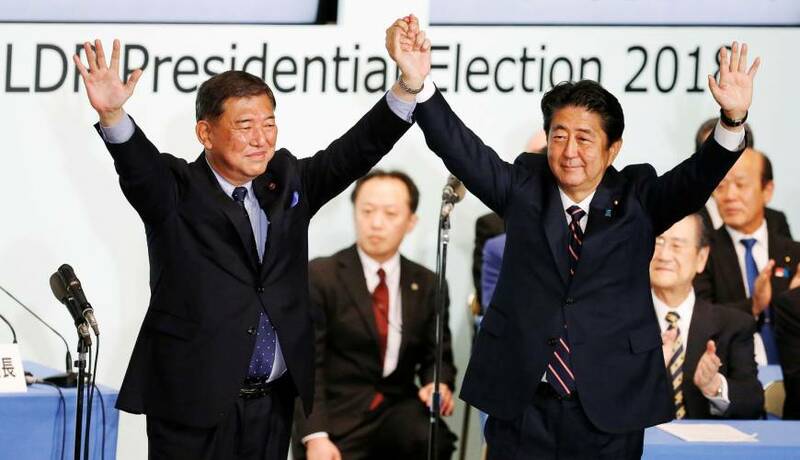 Some lawmakers close to Abe have even argued that such a referendum should be arranged before the Upper House election set for next summer, when the two-third “supermajority” of the LDP-coalition and other pro-revision parties in the Upper House will be at risk. To initiate a national referendum on any constitutional revision, support from two-thirds of both chambers of the Diet is required. In the referendum itself, a majority of voters need to be in favor of the revision. Abe has pledged to submit the LDP’s proposal for revising Article 9 to an extraordinary Diet session starting later in this fall. But polls have so far indicated the nation may be widely split over his call for constitutional revision. Failure in a referendum would likely force him to step down as LDP president and as prime minister, political observers say. “A national referendum is highly risky for Abe. If he fails to revise the Constitution, Abe would have no choice but to step down,” said Shiro Sakaiya, professor of political science at Tokyo Metropolitan University and an expert in opinion poll analysis. “I don’t even think he would try to initiate (a referendum) unless he is convinced he is fully ready” for such a risky gamble, Sakaiya added. According to the latest poll, conducted by the daily Yomiuri Shimbun between Aug. 24 through Aug. 26, 45 percent of 1,076 respondents supported Abe’s proposal to revise Article 9, while 38 percent opposed it. Seventeen percent declined to give an answer. The poll also showed that 31 percent thought the LDP should not submit Abe’s revision proposal to the Diet at all. The results suggest voters are sharply divided over any possible revision to Article 9. To win more support from voters Abe has stressed that the revision is needed to put an end to long-continuing academic debates over the SDF’s constitutionality, and that his proposal would not change any substance of the SDF’s current military operations. So voters are “not very much interested” in theological debates between nationalist and pacifist political forces over Article 9, Sakaiya said. That is why many of those polled admit that, while a revision in line with Abe’s ideas may be necessary, it’s not considered an urgent item on the political agenda that the prime minister or the Diet should push at this time. In Sakaiya’s view, these mixed and rather unclear sentiments from voters would make the result of a constitutional referendum on Article 9 highly unpredictable and thus very risky from a political point of view. Abe himself is clearly aware of that risk. In separate interviews with the Yomiuri and the Sankei Shimbun newspaper, published on Sept. 1 and Sept. 2 respectively, Abe strongly argued that a national referendum on constitutional revision should not be turned into a power struggle to topple the government and thus force him to step down. But in the interview with Yomiuri, Abe admitted he “should be ready to take big risks” if he goes ahead with initiating such a referendum. In a live interview with TV Asahi on Sept. 17, Abe also admitted that there was “a very high hurdle” for him to initiate a national referendum in the first place. He pointed out that the LDP by itself does not have a two-third supermajority in the Upper House, and that achieving consensus with junior coalition partner Komeito is not trivial. To initiate a referendum, Abe needs support from 162 or more of the 242 Upper House members. Right now, the LDP only has 126 seats in the chamber. Junior coalition partner Komeito has 24 seats, and together with other minor political parties who support constitutional revision, Abe may be able to secure the support he needs in the Upper House. But Komeito and its supporters have long advocated for pacifist diplomatic policies and are still reluctant to support any constitutional revision that would touch the war-renouncing Article 9. “I want to give it a try over the next three years, but I can’t control everything as I wish,” Abe said about the prospects of a referendum during the interview with TV Asahi. The three-year time frame is a retreat from his earlier goal of enacting a newly revised Constitution in 2020. During the same interview, Abe also admitted that his political clout could be weakened as the end of his next term approaches. LDP rules ban the party’s president from serving a fourth term. “The next three years will be my last term. So people’s attention will shift to who will be the next president after me,” Abe said. On the economic front, too, the next three years could be much harder for Abe than the previous six. Abe has maintained popularity among voters thanks to his Abenomics economic policies, which consist of radical monetary-easing by the Bank of Japan, aggressive government spending and structural reforms to achieve more economic growth. But after more than five years of massive bond-buying operations, the BOJ has yet to achieve its goal of annual 2 percent inflation. The BOJ’s monetary-easing could eventually hit a limit, as the central bank is running out of government bonds to buy from the market. The central bank already owned government bonds worth a staggering ¥465 trillion at the end of June — almost matching the country’s gross domestic product. Izuru Makihara, professor of political science at the University of Tokyo, agrees Abe could become a “lame-duck” leader over the next three years, as voters’ attention will eventually shift to how he brings his administration to a close. But to maintain the political influence needed to keep the party united, Abe has no choice but to continue to vocally call for a revision of Article 9 — even though it may be politically difficult to achieve that goal, Makihara said. “If Abe stops saying he will revise the Constitution, his political dynamism would be immediately lost. So he will keep saying it no matter what,” Makihara said. The first major test for Abe’s new government is likely to come next summer, when half of Upper House members will face an election. If pro-revision political forces are unable to win two-thirds of the Upper House seats, it would be impossible for Abe to initiate a constitutional referendum.